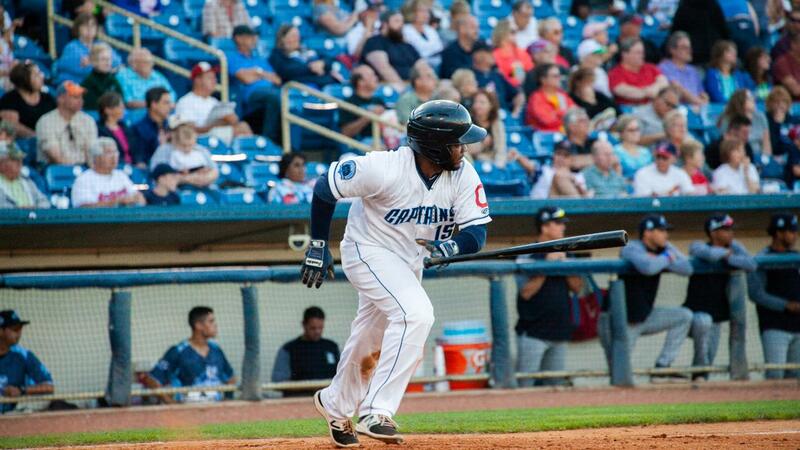 (Eastlake, OH) - Jose Vicente and Miguel Eladio carried the offense on Sunday at Classic Park and helped the Lake County Captains (30-38, 59-79) win their second straight series and extend their winning streak to four games. The Captains defeated the Lansing Lugnuts (37-32, 80-59), 6-2, in the penultimate game of the season. Eladio put the Captains on the board in the second inning. Dane Hutcheon kept the inning alive with a two-out double to right-centerfield. After his two-run home run gave the Captains a walk-off win the night before, the Lake County second baseman ripped a single to center that scored Hutcheon with the game's first run. Eladio came through again in the fourth inning. Vicente slammed a double to centerfield to begin the inning. Lugnuts starter Kyle Weatherly retired the next two batters, but Eladio delivered a line drive single to center that brought home Vicente to extend the Captains' lead to 2-0. Captains starter Juan Hillman cruised through the first four innings. The left-hander allowed just one hit and one walk with five strikeouts through four scoreless frames. In the fifth, however, the Lugnuts came back to tie the score. With one out, Andres Sotillo lined a double down the left field line. Bryan Lizardo came up next and hit a slow roller to third. Hutcheon charged, fielded and fired wildly to first. Sotillo scored the Lugnuts' first run and Lizardo advanced to second. Jesus Navarro followed with a double down the right field line and Lizardo scored to tie the game. Lake County went ahead for good in the bottom of the fifth. Eric Rodriguez led off the inning with his first Captains hit, a single to left field. Daniel Schneemann then hit a grounder to second base and the Lugnuts went to turn two, but shortstop Vinny Capra's throw to first sailed into the dugout for an error that moved Schneemann to second with one out. Todd Isaacs followed with a line drive over the head of Lizardo and down the right field line. Schneemann scored to put the Captains ahead, 3-2. Vicente and Eladio connected again for an insurance run in the sixth. Vicente led off the inning with a double to left field and Mitch Reeves walked. Later in the frame, Eladio singled to left to score Vicente and push the lead to 4-2. Vicente capped his stellar game in the seventh inning. With one out in the seventh, Will Benson worked a walk against reliever Matt Shannon. Two batters later, Vicente cracked a two-run home run to the left field bleachers to give the Captains a 6-2 lead. Hillman (6-12) earned the win after pitching five strong innings. The left-hander allowed two runs - one earned - on four hits. He struck out six and walked one. Weatherly (3-3) took the loss. The Lugnuts' right-hander pitched six frames and allowed four runs - three earned - on nine hits. He struck out five and walked one. Robert Broom earned his second save and extended his scoreless innings streak to 14.2 innings. The right-hander pitched 2.1 shutout frames with two strikeouts, no walks and two hits allowed. The Captains have won four in a row and will go for their fifth straight victory in the final game of the season. First pitch between the Lugnuts and Captains at Classic Park is scheduled for 1:00 p.m. on Monday.